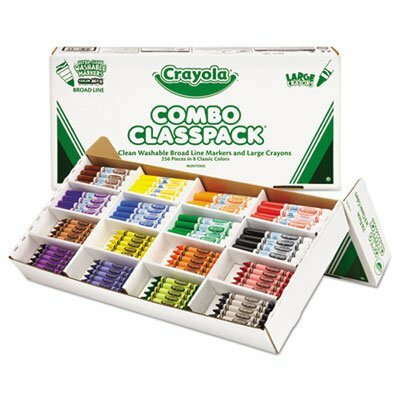 Combines 128 Large Crayons and 128 Ultra-Clean Washable Broad Line Markers in one handy pack. Sturdy storage box is ideal for classroom and group use. Color(s): 8 Assorted; Assortment: Black; Blue; Brown; Green; Orange; Red; Violet; Yellow; Crayon Size: 4 x 7/16; Size Group: Large. Crayons and washable, broadline markers in a storage box. Ultra-Clean Washable Markers offer vibrant ColorMax? colors with Crayola's superior washable technology. Classpack offers value and convenience for classrooms.